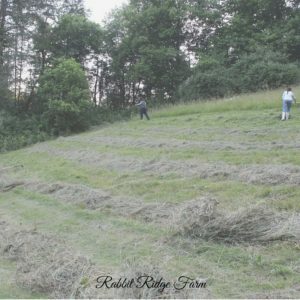 Recently we were given the opportunity to hay a part of a a local field that was too steep to cut with a tractor. Since we don’t have a tractor it was a perfect job for us! We cut and gathered all the hay by hand which may seem really silly to many people who put up hundreds of bales a year but haying by hand really isn’t as hard as you think and can be a great option for small homesteaders. There are 4 main reasons we think haying by hand is a great idea. If you’re already on board feel free to skip this section. First off we really don’t need that much hay (yet). 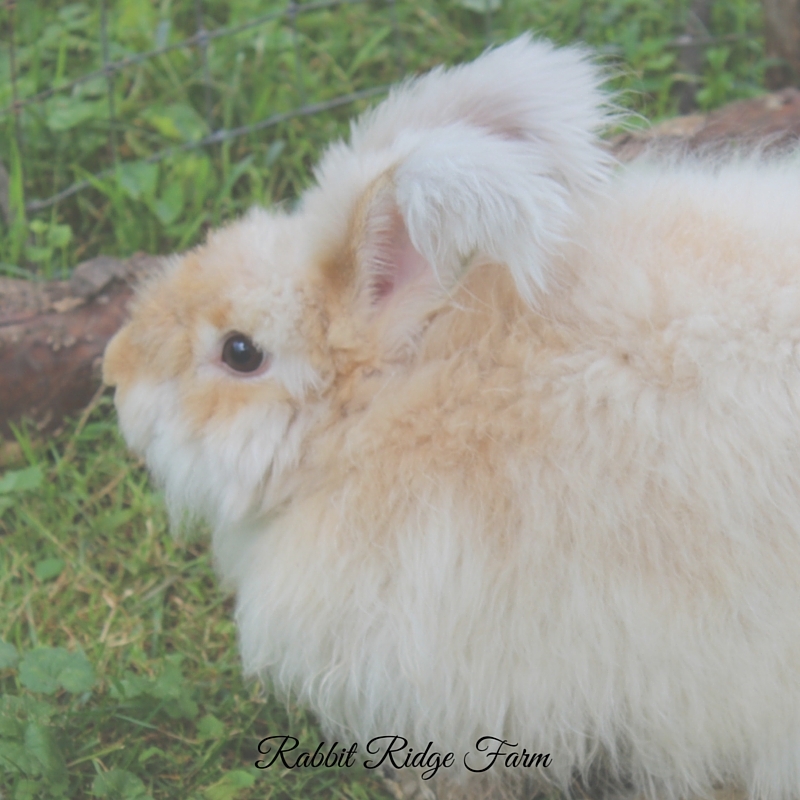 We use hay for bedding and feed for our rescue animals including rabbits, chickens, and ducks. We also mulch our gardens with it. We don’t currently have any large animals here at the sanctuary that require a lot of feed. Secondly we don’t have to spend money on purchasing, renting, or maintaining a tractor and equipment. Would it make things faster? You bet. Is it worth the money right now? Not so much. We can hay areas a tractor can’t. That’s the whole reason we had access to this field. We were willing to put in a lot of time and effort that no one else was and it scored us some free (except for our time) hay. The last reason is that haying by hand is so much more sustainable. We didn’t have to burn fossil fuels or compact the earth with a heavy tractor. We also didn’t kill as much wildlife. I’ll be honest, a gardner snake was accidentally killed but we saw several snakes, turtles, and toads that would’ve also perished had we been using a tractor. Though we didn’t see any in our field fawns, nesting songbirds, and turkeys with babies all often fall victim to tractors. Interested yet? Well maybe you will be when I explain how simple it really is. All you need is a scythe, sharpening stone, rake, pitchfork, and time. There are a variety of scythes available and no they definitely aren’t all equal. Our personal favorite is an aluminum handled, Austrian scythe. Our scythe is light and easier to use then an American scythe which traditionally have long, heavy, and curved wooden handles. I’ve tried both and really can’t imagine how people use the American style. I haven’t had a problem using a scythe that Scott purchased however many people feel that scythes work much better when fitted to an individual user. Many scythe dealers that carry different makes and models can assist you in finding the best one for you. Some will even custom make a scythe handle for you if you’re willing to go that far. For more information on finding a good scythe for you and how to care for a scythe I highly recommend this article. Any rake will really do, we used our garden rakes however if you’re planning to do this on a regular basis you may consider buying or make a hay rake. Hay rakes traditional have prongs that are spaced farther apart and are blunt so that don’t catch and get tangled in the hay. They are typically made of wood. In fact they were often made from just sticks. Traditional hay forks are three pronged and made of wood (modern metal versions are available) and sometimes had handles up to 8 feet or more to enable you to throw hay high onto a pile or wagon. We used a pitchfork with more prongs. It worked alright but hay got caught in it more. Once you have your tools you can begin cutting. Learning how to use a scythe is easier to see than explain (Youtube may help here) but basically you swing the blade parallel to the ground in and arc. Follow the swing backwards to right any grass that has been knocked over but not cut. It is easiest to cut a small amount at a time and you should make sure to stand straight rather than bending over as you swing. You will also be much more efficient if you sharpen your scythe with a whetstone periodically. How often really depends on the grass, your scythe, and how much you cut with each swing but once you try it a few times you’ll be able to tell when your blade is getting dull. It’s helpful to have a friend helping while you cut they can follow along and rake the hay you cut into a windrow. Then you can switch off. Cutting hay with a scythe is a lot more tiring than you’d probably imagine. Leave the hay in windrows for a day then go back and flip your windrows over and leave them for another day to ensure all your hay is dry. Putting up damp hay will result in mold which can make livestock and people breathing it in sick. Times may be different depending on the humidity and how sunny it is. This is why it’s very important that you cut your hay with at least few days of nice weather ahead. When your hay is dry it will still have good green color but will not feel damp to the touch. Then you can pull all the windrows into piles to be gathered and stored. I think that’s one of the easy and fun parts of haying. If your hay field is fairly level you may choose to drive some sort of vehicle around to the piles. We just pulled all our hay down the hill. As our hay field wasn’t on our property so we hauled our hay home in our truck. It stays in better than I would’ve thought thought. We placed a few ratchet straps over the hay, across the truck ben just in case. Then we just piled it under cover. If you don’t have a barn you can just pile your hay on pallets or some brush and then place a tarp over it. Another way to store hay which we haven’t personally tried is a traditional haystack. The hay is stacked on and around a pole that has a cross piece about 1-2 feet off the ground (sometimes more cross prices are added depending on the size of your pile.. The outside is then combed with a hay rake so that the outside hay goes straight up and down and sheds water. Also if you’re really in the mood to get your traditional hay game on you should try your hand at making switchel. A traditional and delicious hot weather, haying drink of choice in many cultures. We loved it! You can read more about that and find the recipe here from Stone Axe Herbals. 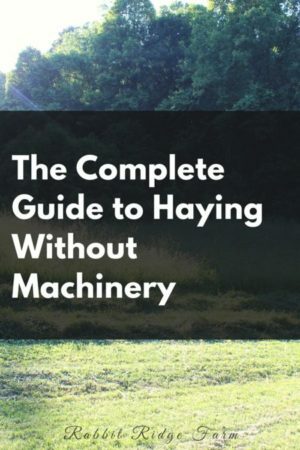 4 Responses to "The Complete Guide to Haying Without Machinery"
Thanks! Wow that’s a lot to be doing by hand! I bet that was exhausting. We’d like to have sheep some day too and I imagine then that we’ll be purchasing some equipment.